For your Wednesday reading enjoyment. 6 - the number of people watching a movie on our king size bed last night. 4 - the number of those people that should have been in bed instead of watching said movie. 5 - the number of projects waiting for me to finish them, so I can blog about them. 3 - the number of people in this house who have conflicting activities coming up on Saturday. 1 - the number of cars we have available (since John's accident totalled our other one) to get said people to their activities. Saturday is going to be interesting. 28 - the number of times I've stayed up past midnight in the past month. 28 - the number of times I've had a hard time prying my eyes open the next morning. 1 - the number of books I've managed to start reading this month. 1 - the number of books I'm still trying to finish this month. 3 - the number of times I've lost and then gained back the same 10 pounds since August. It's back to Weight Watchers for me this week! 20 - the number of pounds I have to lose before Summer. 20 - the number of pounds I've been trying to lose since last Summer. 239482380 - the approximate number of photos I need to print out for scrapbooks. 4 - the number of years it's been since I've put a single photo in a scrapbook. 3824 - as of right now, the number of fabulous followers of this blog on my Google Friend box on my sidebar. I JUST LOVE YOU GUYS! Thanks for reading! 1 - the girl who loves to write this blog for you. 1-The number of people in my room enjoying your post entirely. 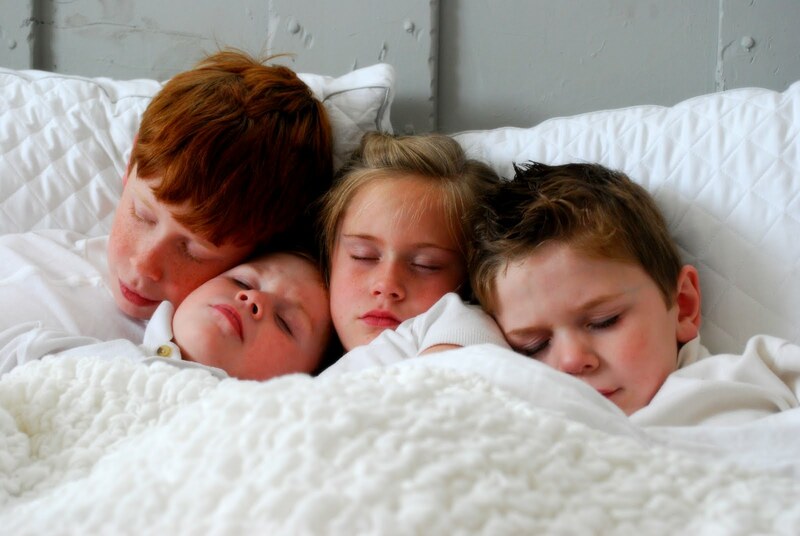 2-The number of Red Heads I counted in your bed ;) I Adoreeeeeeeeee Red Heads :)))) Wonderful post, made me smile. It's so interesting to read about your life in numbers. I share a lot of those same numbers in my own life! Your blog is always so lovely! Keep up the good work! I need (want) to lose 10 pounds. I haven't printed pics out for a scrapbook in about 5 years. I sure wouldn't mind having a little one in the house though! Here I am a grandma at 42 and there are alot women who are preschool mom's at my age! YIKES!! Hmmm....I just ordered a Project Life kit from Becky Higgins to see if I can get my scrapbooking/photos under control. Here's hoping it works! what a super fun post!! i wrote one like this a few years back & was just thinking the other day that i might do it again...now you've inspired me. good luck on the 20.
what a fun photo in the olympic rings! the top picture of your babies is one of my fave ever. so sweet. looks like something right out of a book! i haven't been to target this week either. i did finish a book. but it was only a novella! Love it when my 5 big ones jump in our king size bed to snuggle! As far as those numbers that live on the hip? I have a solution for you and it doesn't involve counting "numbers"! Honestly! The only numbers you would count are the ones coming off the scale! How does 10-20 pounds in 24 Days sound? Until then I count the wonderful weightless numbers of life with you. LOVE this Wendy :) Hope all is welL! I'm going to do a post like this too! It's so much fun! I really loved reading it. I am going to think of you today as I work on one of my 8 unfinished projects! Love You!! Such a cute post! I love it. Enjoy life! Doesn't look like anyone is actually watching the movie, but they sure do look comfortable! 1 - the number of chicks sitting at my dining room table reading your blog! 3 - the number of blog entries I made before complete bloggy-block! So happy I have yours to enjoy!